We have written before about what you need to know if you are driving a golf cart or a Low Speed Vehicle (LSV) in the state of Florida. There has been a lot of misunderstanding about the use of golf carts versus LSVs and what the repercussions are if you are involved in an accident. Below is a summary of the key important facts you need to know. What is the Difference Between a Golf Cart and a Low Speed Vehicle? Under Florida law, a golf cart is designed for recreational use on a golf course. Usually they are limited to speeds of less than 20mph. In contrast, a LSV, sometimes referred to as a Neighborhood Electric Vehicle (NEV) or a street legal golf cart, is defined using certain state and federal regulations. LSVs are equipped with headlights, turn signals, parking brakes, rearview mirrors, seatbelts, and vehicle identification numbers. They may be operated on streets with a posted speed limit of 35mph or less and they are capable of exceeding speeds of 20mph. Do I Need a Driver’s License to Drive a LSV? Yes! Although they may look different from your standard automobile, in many ways the law treats them the same. You must register your LSV, insure it, and have a valid driver’s license to drive it. 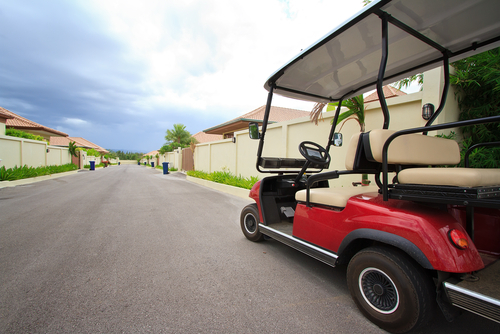 While they may seem fun and harmless, golf carts and LSVs can do serious damage to another person or their property. It is important to keep in mind how the law treats LSVs and make sure to not let young children operate them. You Must Insure Your LSV! Golf carts are not required to be insured unless they are street legal. That being said, if you will be using your golf cart regularly, it is a good idea to carry insurance on it to protect yourself and others in the event of an accident. Otherwise, you might be personally responsible for any damages that might happen in the case of an accident. Under Florida law you are required to title, register, and insure your LSV with PIP/PDL. It is also wise to carry full coverage if you intend to drive it on the road. If you in any way modify/upgrade your golf cart to make it go faster than 20mph then you will be required to register and insure your vehicle. If you modify your LSV to go faster than 25mph, then it is no longer exempt from the Federal Motor Vehicle Safety Standards established for LSVs and it will legally be treated as a standard passenger vehicle. This means that your vehicle will now need to comply with all federal safety standards required for passenger vehicles which can get very expensive. Always remember to drive safely, whether it is on a golf cart or a LSV. If you have any questions regarding golf cart/LSV insurance requirements or if you have been injured in an accident involving a golf cart or LSV, do not hesitate to contact us online or call us directly at 888.815.6398 for your free consultation.